Last weekend in the evening we passed trough the Old City when I remembered about the Caragiale festival taking place there in the streets. The festival opened just a few days before and a detour was in order to see what is about, but in the way to it we encountered this couple, going in the same direction (they looked at the play less than one minute and left) – they were perfect for the setting, if Caragiale would be alive, such people would be the heroes of his comic writings. 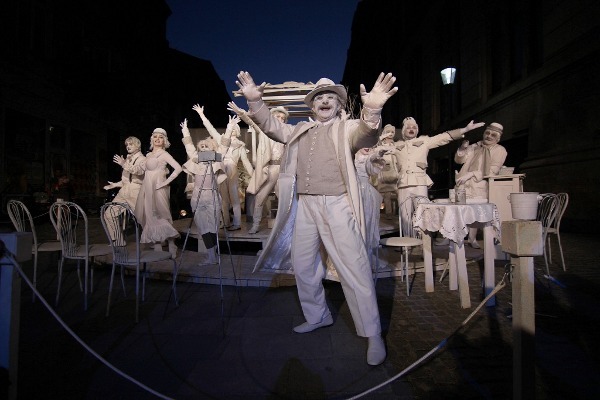 In the street, the Masca Theatre was playing an adaptation upon Caragiale’s “O noapte furtunoasă”, which the audience seemed to enjoy (Caragiale has only a few plays and some of his shorter pieces may be theatrically adapted, but will that be enough for 100 representations, as advertised?). 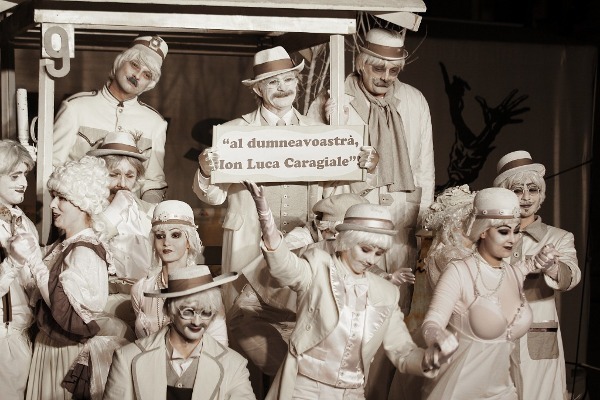 This one was a strange adaptation, with white costumes (more like the living statues the Masca actors do often) and with Caragiale himself introduced as a character in the play. I can’t get out of my head the above-mentioned couple and it fitting in the scene, the tough (and rich?) guy getting his “demoiselle” in the city center to see “comedies” (or more like her dragging him there) and she being like…. like in that picture, which does not need much words. They say Caragiale live forever among us.